It's almost a year of short video sharing platform "Vine" vacuum, if not say die. The application is replaced "Vine Camera" which has true features and similar functions. The difference, Vine Camera has no community base that previously existed on the Vine. Vine Camera is just a video editing app without the ability to share the results with friends and comment on each other. Do not want to hiatus long, Vine seems ready to return to show off as a forum to share between the creators and comedians. Vine founder, Dom Hofmann, indicated it through his Twitter chirp. Dom Hoffman shares a logo that says "V2". The color and shape of the logo is similar to Vine. 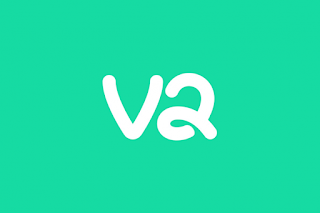 As a result many assume that V2 is "Vine 2.0", reborn version of Vine. Also read: No More Bread, Baked Sweet Potato Topping Now Trendy! Until this news aired, the many inviting chants were rewarded with 123,000 retweets, 263,000 likes, and 6,800 chats, as compiled by KompasTekno on Thursday (7/12/2017), from Dom Hofmann's Twitter account (@dhof). The assumption about Vine 2.0 was reinforced by Dom Hofmann's chirp on December 1st. He said he would follow up alias follow-up the fate of Vine. No need to find an investor, he is ready to fund his own Vine development as a side project. The reason, Dom Hofmann has a major job that remains a priority. What kind of Vine 2.0 is being developed? Will it be a threat to other video platforms like Instagram, Snapchat, and YouTube? Let's wait. 0 Response to "A Year of Vacuum, Vine Will Live Back? (Vine 2)"